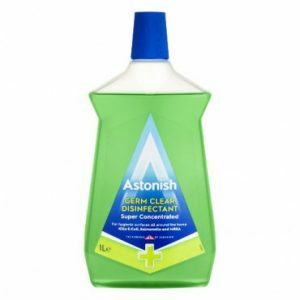 There are loads of Astonish cleaning products available in Poundland, check below for the range on offer in most stores. Our kitchen cleaner is that every day helping hand, the hero under the sink. 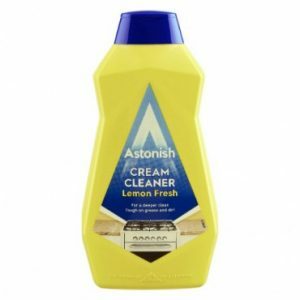 Cutting through grease and kitchen grime with ease, leaving you time to take in the zesty lemon scent. 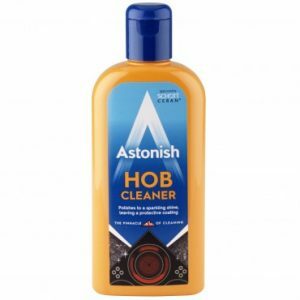 The Astonish hob cleaner has been specially formulated for use on ceramic, glass induction and halogen hobs as well as microwaves. 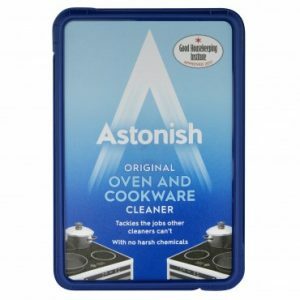 The powerful cream easily cuts through burnt on stains, leaving your hob sparkling clean whilst conditioning the surface to build up a protective layer, finishing with a beautiful shine. We think our daily shower is a sparkler. Use after showering, simply spray over surfaces to prevent the build-up of watermarks & limescale and reducing the need for that deep clean. A winner all round. Our bathroom cleaner scrubs up very well. Not only does it make short work of the tub but the rest of the bathroom too. It removes soap scum and watermarks with ease to leave a streak-free shine. We’re off for a nice long soak in the tub after all that cleaning. 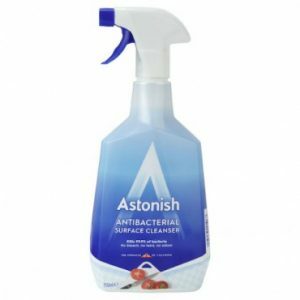 The Astonish stain remover spray is a powerful, fast acting and versatile stain remover, formulated to penetrate deep into fibres to break down and disperse even the toughest stains. 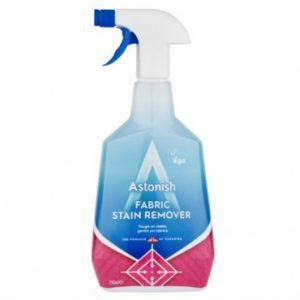 Ideal for use as a laundry pre-wash stain remover or spot treatment on carpets, upholstery and even curtains. 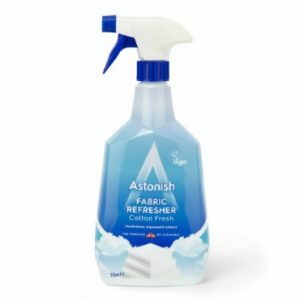 Astonish Fabric Refresher is specially formulated to freshen and eliminate odours on fabrics by penetrating deep down and neutralising trapped smells. 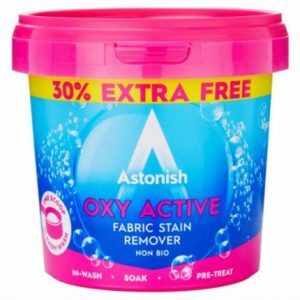 Oxy stain remover is a super concentrated, powerful stain removing powder which effectively lifts and removes even tough dried on stains. It rids fabrics of unpleasant odours, whilst also brightening whites and colours. Ideal for adding to each machine wash, used as a pre-wash treatment or for soaking. Also suitable for a multitude of uses in and around the home. 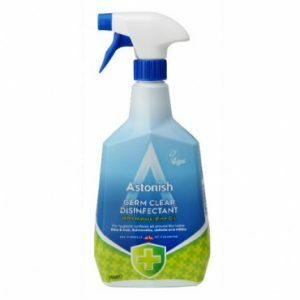 The antibacterial cleaner is specially formulated to effectively clean surfaces killing 99.9% of common germs. Effective against e-coli, salmonella & listeria. The no bleach, no taint and odourless formula is designed to use on food preparation surfaces such as chopping boards as well as fridges, high chairs, bins & toilets. For complete disinfection allow 5 minutes contact time. 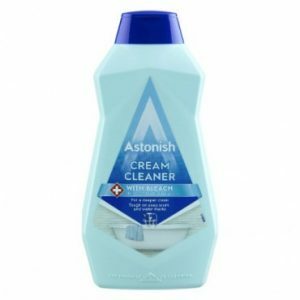 The Astonish cream cleaners are formulated to give a deeper clean on tough soap scum and water marks. 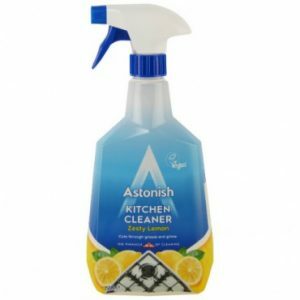 The cream has built-in degreasing agents and millions of tiny natural mineral particles to help lift dirt away making those tough cleaning jobs that little bit easier. With our bleach variant killing 99.9% of bacteria you can also be assured your surfaces are hygienically clean. Mild and effective liquid handwash. 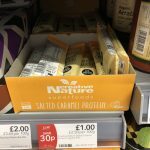 Moisturises & deodorises. pH balanced, antibacterial and gentle. This contains no actual milk or honey! 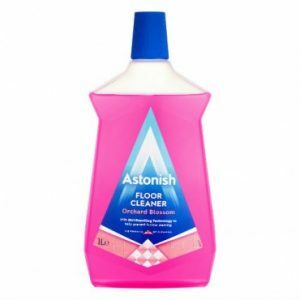 Astonish floor cleaner contains the beautiful scent of Orchard blossom. 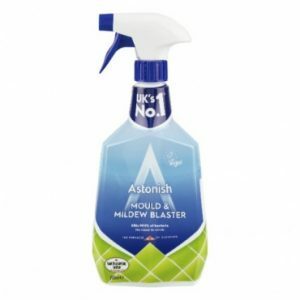 It will remove dirt & grime to leave floors sparkling, whilst the dirt repelling technology will leave a protective coating after cleaning helping to prevent further staining. Germ Clear Disinfectant with natural pine oil can be used to eliminate germs and bugs on surfaces around the home including E.coli, Salmonella, Listeria and MRSA. It's also great as a deodoriser in sinks, drains and toilets. Our Germ Clear Disinfectant with natural pine oil and can be used to control germs and bugs on surfaces around the home including E.coli, Salmonella, Listeria and MRSA. It’s also great as a deodoriser in sinks, drains and toilets. Now all you need to do is stop the kids putting their mucky fingers everywhere.